Mr. Lyman H. Allen, a Trust Officer of the Boston Safe Deposit and Trust Co., encloses a $25.00 check donation for the Berry Schools. 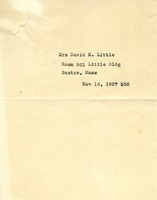 The donation is from Mr. Watson for the calendar year 1929. 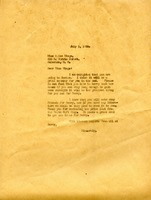 A letter to Miss Wingo about her going to Boston. 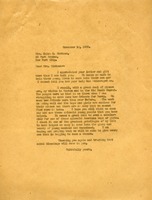 Martha Berry writes to Mrs. Hammond thanking her for her letter and says that it is so kind of her to try to raise $100,000 of the million dollars. Martha Berry says that she thinks it would be better to start with half a million because she has a friend that promised to give $100,000 if they raise $400,000. She says that she thinks she should try visiting her friends in Boston and that she's greatly enjoyed reading the booklet from the Pilgrim Fifth Annual Trip to Berry. 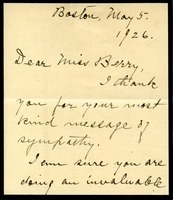 Martha Berry expresses that she knew Mr. Curtis years ago in his mothers home in Boston, and has always wanted him to visit the Berry schools. She says that he would be interested in the work they are doing. Berry wishes that Curtis would visit the schools. Martha Berry tells Carlson that she wishes to have one motto for both the Boys' and Girls' Schools: "Not to be Ministered Unto, but to Minister." She originally had the motto in mind for only the Girls' School, but thinks it would be less confusing to use the same motto for both. 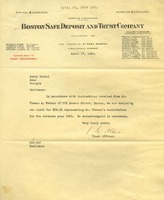 Berry also asks Carlson to send her a Boston telephone director to use in verifying the addresses for potential donors. 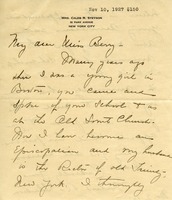 Stetson recalls hearing Berry speak at Old South Church in Boston. In response to a recent appeal she sends funds for a scholarship, mentioning that she is now Episcopalian. Her husband, Caleb R. Stetson, is the Rector of Trinity Church in Manhattan. Mr. Wight informs the Berry Schools that Mrs. Kingsmill Marrs passed away on September 23, 1926. 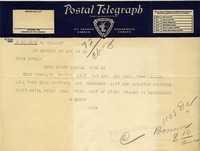 He asks that her name be taken off of Berry's mailing list. Mrs. David Little donates $50 to Berry Schools. 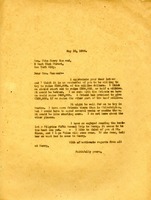 A letter to Martha Berry from Ellen A. Wood thanking Berry for the good work she is doing with her students. Wood makes a point to describe the big impact Berry is having on her country. 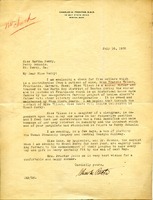 This letter is a response to an appeal letter sent by Martha Berry. 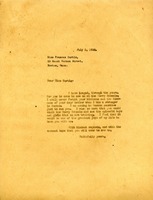 Caroline G. Ross sends twenty five dollars to Martha Berry.